Home /Digital Solutions, Do-it-yourself, Grow your business, Resources/How to setup your first blog? Blogging is an effective technique to promote your digital assets online or to make some money from advertisements. Blogging is a very effective tool to engage your web visitors with useful information and show your mastery in your business domain. WordPress is a popular and widely used platform to setup a blog with any website or a standalone blogging platform for your passion. Here I am going to explain to you how to setup a WordPress blog? 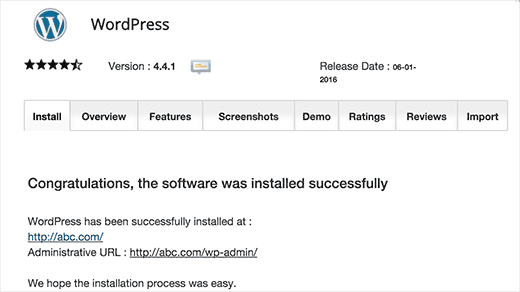 MOJO Marketplace provides a simple WordPress installer tool. Several hosting companies use this to provide a 1-click WordPress install experience. 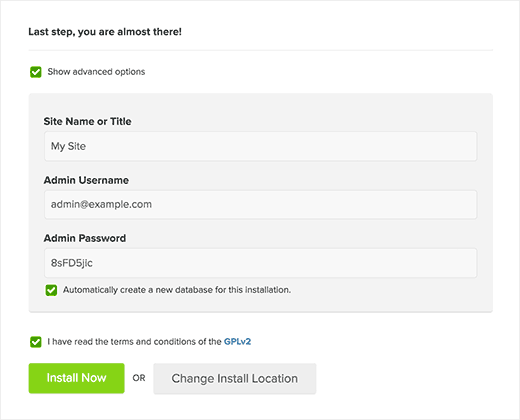 This installer is integrated into their cPanel dashboard. For this tutorial, we will be showing you the BlueHost cPanel. Simply login to your hosting account and then on your cPanel dashboard scroll down to the website section. Click on Install WordPress icon or 1-click Install. They will both take you to the MOJO Marketplace where you will see an overview about WordPress with a Install button. You need to click on the install button to continue. MOJO Marketplace will now ask you where you want to install WordPress. Simply select your domain name from the dropdown menu and click on the check domain button. You will notice that MOJO Marketplace has already given your site a title ‘My Site’. It will be using your email address as the username and entered a random strong password. You can change all these settings. You also need to check the terms and conditions checkbox. Once you are done, you can click on the Install Now button. You have successfully installed WordPress. Click on the View Credentials button to go to MOJO Marketplace dashboard and scroll down to the notification center. This will display the installation status and success notice. 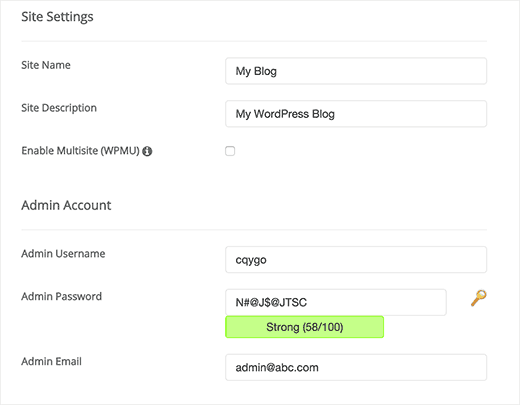 You will also find links to your site and WordPress admin area along with the username and password you will need to login. 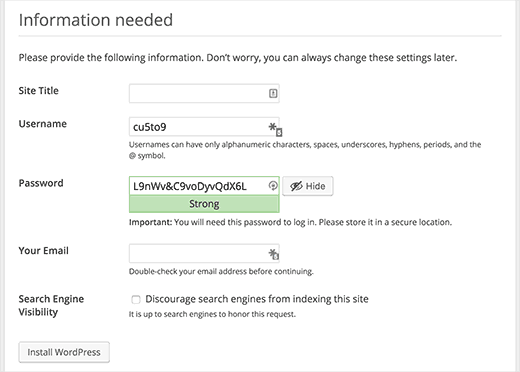 Simply login to your cPanel account and look for Softaculous icon or WordPress installer icon. You will find them under Auto Installers section. 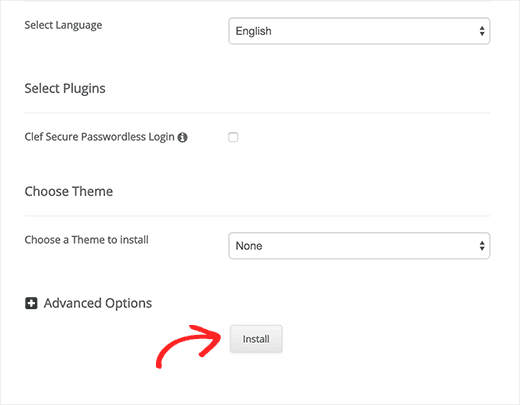 Clicking on any of these icons will launch Softaculous auto-installer for WordPress. 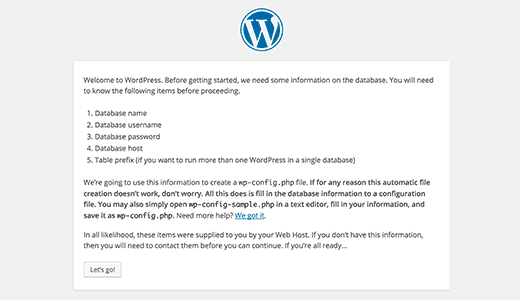 First you will see an overview of WordPress. You need to click on the Install tab to continue. Softaculous will run the installer using the settings you provided. You will see a progress bar with installation status. 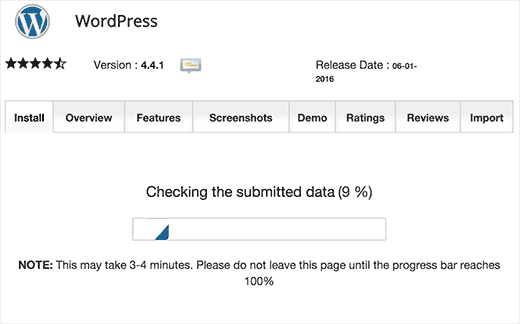 It will take a couple of minutes, do not close the window until the progress bar reaches 100% otherwise this may affect your WordPress installation. First you need to login to your hosting account’s cPanel dashboard. Scroll down to the Software and Services section and then click on the QuickInstall icon. 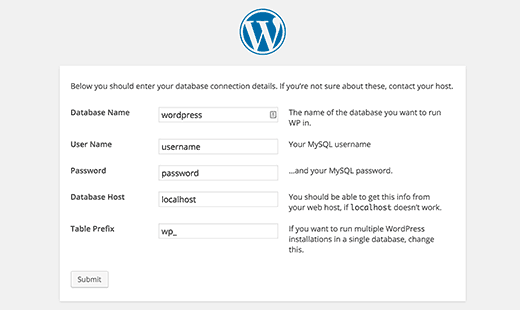 This will bring you to setup your WordPress install settings. First you need to choose the domain name. 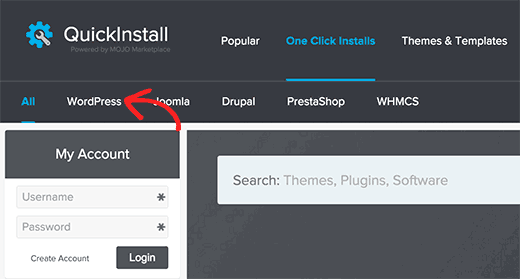 If you want to install WordPress in a sub-directory like example.com/blog then you need to enter blog in the install path field. Leave it blank if you want to install WordPress in the root directory, like example.com. 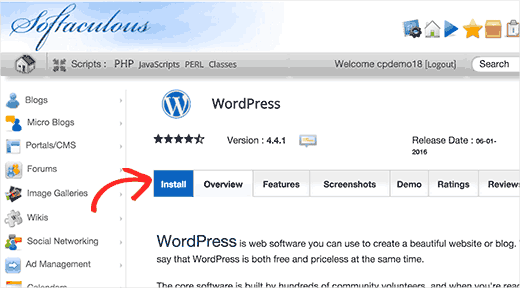 Once you are satisfied with the settings, click on Install WordPress button to begin the installation. 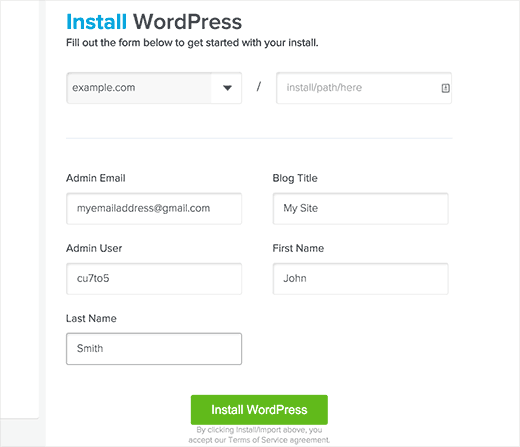 QuickInstall will now install WordPress for you. You will see a progress bar and later success message when it is done. Click on the drop down icon next to view credentials button in the success message. A fly down menu will appear with login credentials and a link to the admin area of your newly installed WordPress site. 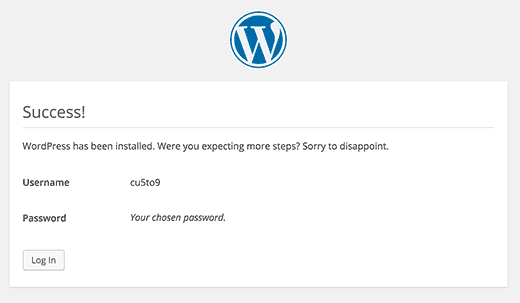 Manually installing WordPress is also known as the famous 5 minute install. However, manual installation has a few added steps, and you will need an FTP client for that. 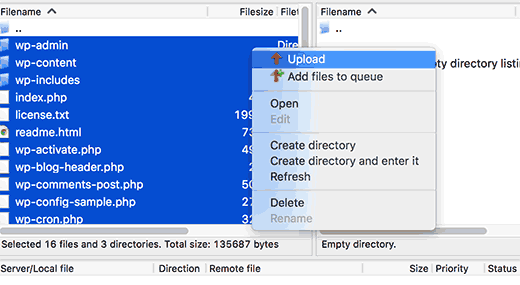 Take a look at our beginner’s guide on how to use FTP to upload WordPress files.